Christmas is packed away and it is far too early for Valentine's Day. Spring is merely a hope. Table decor during the month of January can be a challenge. So many wintery themes are incorrectly considered Christmassy (snowmen to name one). What to do? 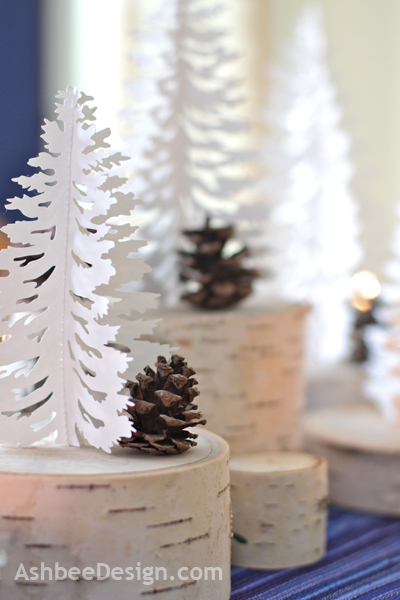 This year I combined white trees with white birch, pine cones and white candles to create a winter arrangement that meets the essence of the season. I started with my Silhouette Cameo and, as I worked on figuring out the finances for 2012 to pay January taxes (ugh! ), I kept the Cameo cutting tree silhouettes. This silhouette I created by downloading a pdf of a pine tree silhouette. In iDraw I modified the silhouette filling in thin areas, adding the snow and interior cuts. I then cut pairs in a variety of sizes and sewed them together with white thread. This is the tree pattern I used in my moosescape project as well although I refined it some more for this project. I then sliced up one of the birch logs I had been saving from my birch porch arrangement from last year. The slices range from 1 to 6" thick and are about 6" in diameter. I also cut small smaller branches for birch filler stumps. 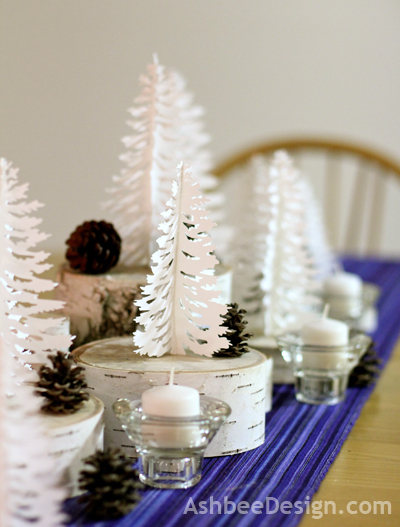 I unpacked my pinecone collection (another item that gets mixed in with Christmas Decor) and my IKEA candle holders and started arranging a winter forest on my table. And in the evening for dinner, I lit the candles! David said it was his favorite centerpiece of all. I think it is mine, too. 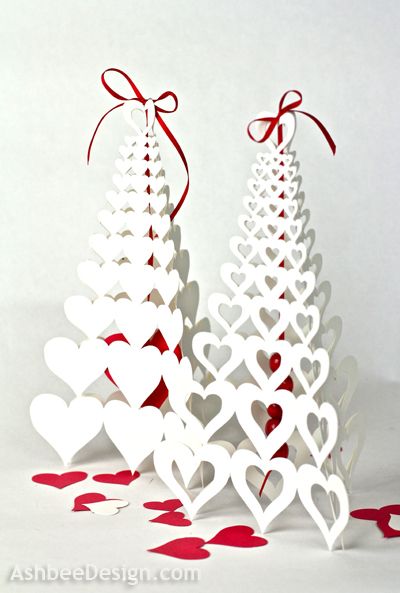 I just created another Silhouette Tree Project for Valentine's Day and posted about it here. Thanks so much for sharing how you made the beautiful trees. 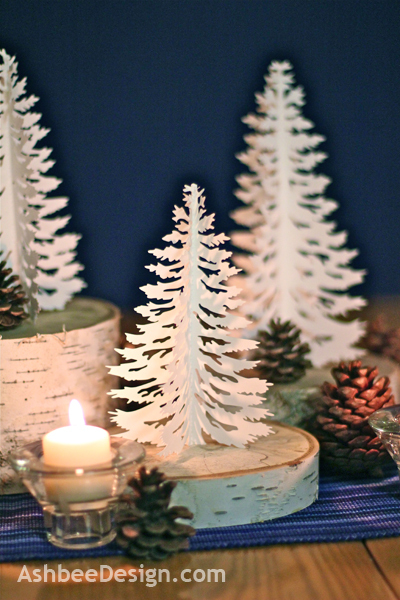 The whole pinecone and birch centerpiece is gorgeous! Thanks for commenting. I am loving the combination and the centerpiece got rave reviews from my diner guests! I like the wintry look of the trees. I love your table centrepiece. 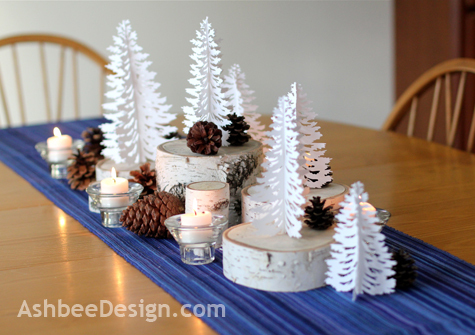 The trees and the birch logs look perfect for midwinter-post-Christmas table conundrums. Thanks Grace, I love it too. So much in fact that I might just skip a Valentine taablescape! Looks great! You could sell those trees! Let me know if you do! Thanks, I'll keep you posted. Not planning to sell yet but one never knows! I'll be your first customer! Love these! Did you make them out of felt? I think I missed that part. 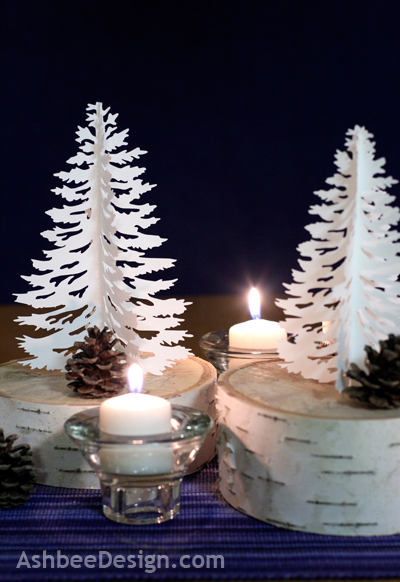 No, the trees are made from paper, everything else is natural! I used my silhouette machine to cut the trees, made two and stitched them together to get the 3-d effect. 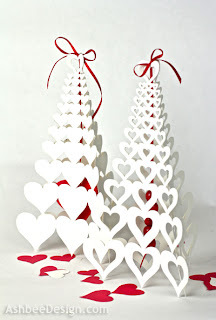 So pretty and perfect decor for January! I'm gonna get hubby out with me searching for fallen birch trees in our neck of the woods! Thanks for the inspiration here and in your other "birch" posts - checked 'em all out! Terrific porch/entry decor! Thanks DD, For those that don't know about my other birch posts read on. I have blogged extensively about using birch in décor. I pulled all of those articles together into my Birch Overview post located here. If you like birch trees you'll love this page and link set! Oh my...these darling little trees are just full of charm. Sorry, about the upper comment little hand hit some buttons and publish. Really cute center piece and I love those shadows in the am light. Computing with a little one around can be a challenge. I try when I am visiting grandkids and just have to give it up! Thanks for taking the time to comment. January is generally a snowy month here in Connecticut as well but not so far this year. Fifty degrees yesterday! Could you tell us did you use clipart or did the silhouette machine have that pattern. I've been pondering whether to buy one-they are not cheap and my question is are they worth the money. thanks much for the post. I used clip art as a beginning and then modified it to meet my needs. I haven't purchased anything from the Silhouette store yet, I have so may ideas that I keep making my own designs. Great centerpiece! Thank you for joining Home Sweet Home! This is the perfect centerpiece for January! Thank you for sharing at TTF last week. Have a fun day! Since I don't have a machine, I'm still waiting for you to sell these! You don't need to stitch them together. Just mail them flat! Really love the look! Love the look of birch wood. So gorgeous!! Thanks for linking up at Romance on a dime!! Pinning this. OK, saw your red, white and blue trees and was reminded of this post. I still want to buy some of your trees. 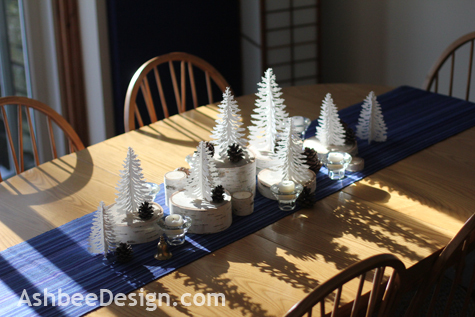 I do a Christmas Extravaganza at our church and would love to do a table based on your trees. If you would sell me 5 trees, I would love it. Let me know. Oh my gosh! My heart flutters looking at these! So pretty! Hope to have the cutting files up on the Silhouette online store in the next few weeks.